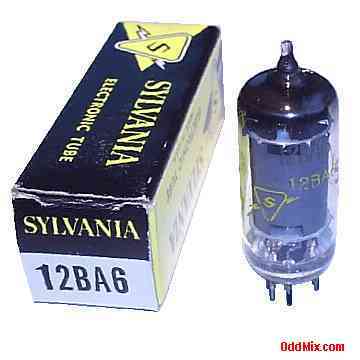 This is a genuine, vintage Sylvania 12BA6 Remote Cutoff Pentode electronic tube. Miniature type used as RF or IF amplifier in many lightweight, compact, portable operated AM and FM or TV (television) receivers and other wide-band, high-frequency applications in a variety of equipments. Excellent part for antique radio or television restoration. It is a NOS tube - New Old Stock, unused, boxed, excellent condition.